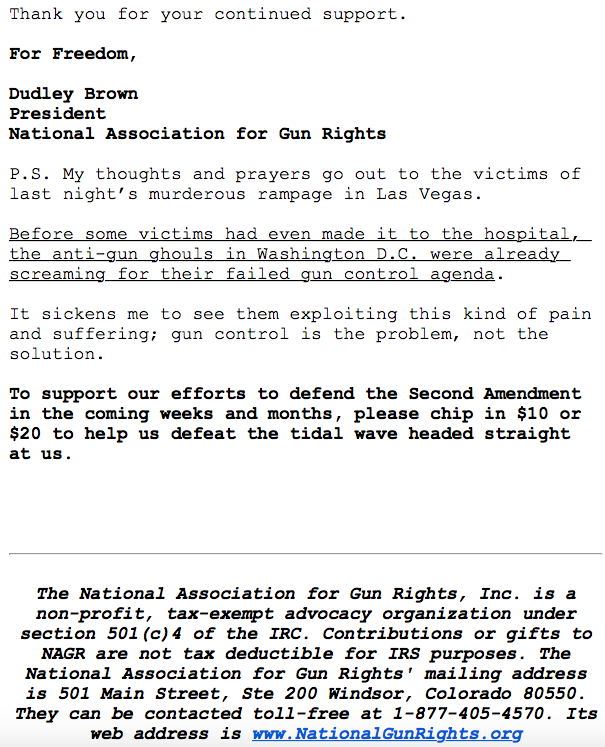 Dudley Brown, a gun lobbyist who runs both Rocky Mountain Gun Owners and the National Association for Gun Rights, sent out a fundraising email soon after Sunday night’s devastating mass shooting in Las Vegas, the bloodiest in American history. Brown seized upon what he apparently regarded as a fundraising opportunity less than a day after at least 59 people were murdered and hundreds more were injured at a country music festival after a gunman shot at them from a hotel. 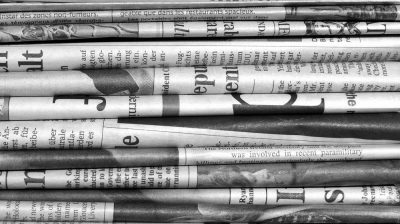 The alleged shooter, who has been identified as 64-year-old Stephen Paddock, brought 23 guns into his hotel room that night. 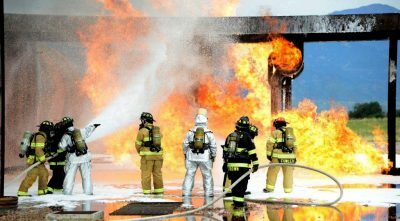 One used in the attack was an AK-47 type rifle with a stand used to steady it while firing. 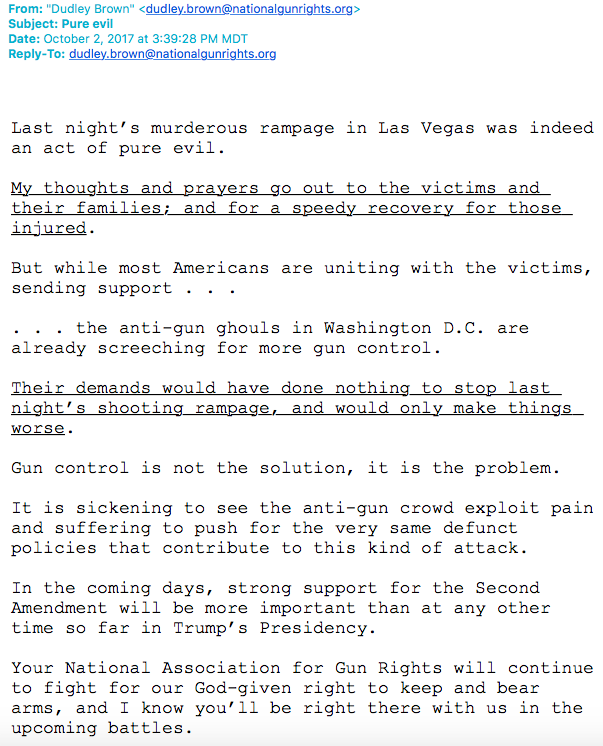 In a fundraising email, Brown warned that “the anti-gun ghouls in Washington D.C. are already screeching for more gun control” and called it “sickening” that gun control advocates would “exploit pain and suffering” in such a way. 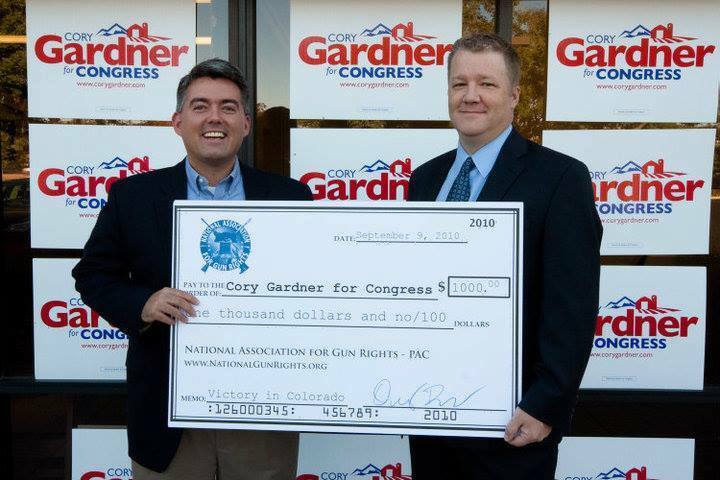 Brown has thrown financial support behind a number of Colorado Republicans, including U.S. Sen. Cory Gardner, who can be seen happily taking a check from the gun rights lobbyist in the photo below. Brown also helped elect state Sen. Tim Neville, a Republican from Littleton, in addition to his son Patrick Neville, who serves as a state Representative. 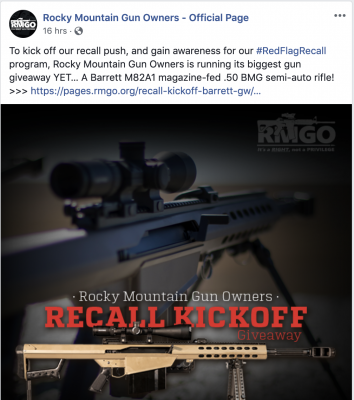 The Nevilles have worked to push Brown’s pro-gun agenda in the state house. This topic contains 0 replies, has 1 voice, and was last updated by Madeleine Schmidt 1 year, 6 months ago.